Description: The column of this sea anemone is smooth, not divided into regions, tall in extension and trumpet-shaped. The tentacles are long, stout, tapering to fine points, not readily retracted. Acontia are present, fairly readily emitted from pores in column. Colour brown, column sometimes streaked with white or blue, disc with broad white or blue lines around tentacle bases. up to 120mm across tentacles. Column very variable in shape but typically trumpet-like, may attach to substrate by adhesive spots (not easily visible) on column. Habitat: On shore or in depths down to 100m or more. On rocks, sea-weed holdfasts, etc., usually occurs in considerable numbers when present. Distribution: Local and uncommon in Britain, in extreme southwest only - Cornwall, Devon, Dorset, Bristol Channel, Kenmare River (southwest Ireland). Common in Channel Isles and northwest France, south to Portugal. 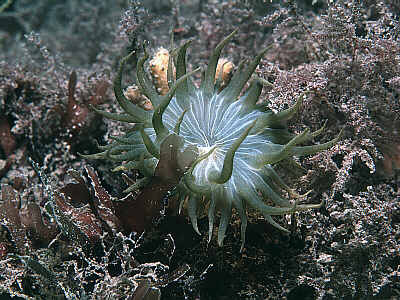 Similar Species: Has been confused with Anemonia viridis, however Anemonia viridis has a parapet, often bright green tentacles, and lacks acontia. Incorrectly synonymised for a while with Aiptasia mutabilis. Grajales A, Rodríguez E., (2014) Morphological revision of the genus Aiptasia and the family Aiptasiidae (Cnidaria, Actiniaria, Metridioidea). Zootaxa. 2014 Jun 27;3826:55-100. doi: 10.11646/zootaxa.3826.1.2. Long, stout tentacles that taper to fine points, not readily retracted. Distinctive colouration, not very variable. Picton, B.E. & Morrow, C.C. (2016). Aiptasia couchii Gosse, 1858. [In] Encyclopedia of Marine Life of Britain and Ireland.